Deadly attack on Istanbul airport Jump to media player A gun and bomb attack on Istanbul's Ataturk international airport has left dozens of people dead or injured. Eyewitness: 'We saw a flash of fire' Jump to media player A gun and bomb attack on Istanbul's Ataturk international airport has left dozens of people dead or injured. BBC journalist reports from Istanbul plane Jump to media player A gun and bomb attack on Istanbul's Ataturk international airport has killed at least 28 people and injured up to 60, with reports of at least one suicide bomber. 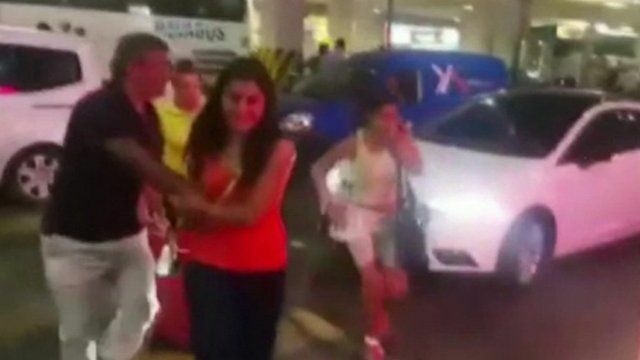 Dozens killed in Istanbul airport Jump to media player The BBC's correspondent was on a plane there. A gun and bomb attack on Istanbul's Ataturk international airport has left dozens of people dead or injured. Three attackers were involved, with one reportedly firing a Kalashnikov as they targeted an entry point to the terminal.